From the Department of Neuroradiology (K.K.-J., D.S., M.B., M.O.B. ), University Hospital Heidelberg, Im Neuenheimer Feld 400; Neurology Clinic (B.W., R.D., W.W.), University Hospital Heidelberg, Im Neuenheimer Feld 400; Division of Biostatistics (T.H. ), German Cancer Research Center, DKFZ, Im Neuenheimer Feld 280; and Clinical Cooperation Unit Neurooncology (W.W.), German Cancer Consortium, German Cancer Research Center, DKFZ, Im Neuenheimer Feld 280, Heidelberg, Germany. Objective To assess the diagnostic value of gadolinium (Gd) contrast administration in MRI follow-up examinations of patients with MS if the T2 lesion load is stable. Methods We included 100 patients with MS with at least 2 cranial MRI follow-up examinations (mean follow-up time 4.0 ± 2.6 years). MRI was performed at 3 Tesla with a standardized protocol including T2-weighted, fluid-attenuated inversion recovery (FLAIR) and T1-weighted contrast-enhanced sequences. Images were analyzed for T2/FLAIR and contrast-enhancing (CE) lesions by 3 independent neuroradiologists. Isolated Gd-enhancing lesions without correlate in T2 and FLAIR images, and reactivated Gd+ lesions were further assessed for size and signal intensity. Results We identified a total of 343 new T2 lesions and 152 CE lesions in a total of 559 MRI follow-up examinations. New T2/FLAIR lesions were present in 30% of the scans. Of the Gd-enhancing lesions, 145/152 (95.4%) showed a correlate as a new T2/FLAIR lesion. There were 3 enhancing lesions (1.9% of all enhancing lesions) without T2/FLAIR correlate and 4 lesions (2.6%) that exhibited lesion reactivation or persistent enhancement over time. As a predictive factor of enhancement, we found that enhancing lesions had a higher T2 signal ratio (T2 SRlesion/normal-appearing white matter: 3.0 ± 0.1 vs 2.2 ± 0.1, p < 0.001). Conclusion The likelihood of missing “active lesions” is overall small (1.7%) if T2 lesions are stable compared with the previous MRI examination. Lesion reactivation is rare. Our study indicates that Gd contrast administration might be dispensable in follow-up MRI of patients with MS if no new T2/FLAIR lesions and no new neurologic symptoms are present. MS is a chronic autoimmune disease of the CNS characterized by the formation of inflammatory plaques, neurodegeneration, and gliosis.1,–,3 The inflammatory attack leads to demyelination and neurodegeneration in the gray and white matter of the CNS. There is still no single diagnostic test for MS, but MRI is regarded as an essential tool for initial diagnosis, monitoring, and assessment of treatment efficacy of patients with MS.4,–,6 Gadolinium (Gd)-based contrast agents (GBCA) are used as standard of care in clinical examinations and in MS trials.7,8 Gd enhancement shows blood-brain barrier disruption (BBB-D) indicating active inflammation of an MS lesion and is interpreted as a surrogate marker of active disease, often relevant for treatment decisions. Recently, there have been major safety concerns regarding linear GBCAs because Gd depositions were found in the brain after multiple injections of linear Gd agents.9,–,11 Thus, it is important to refine the usage of Gd contrast administration to better understand which MS lesions show Gd contrast enhancement and to further tailor Gd administration to situations where it alters clinical management. The present study retrospectively investigates whether the routine administration of GBCAs is justified in all follow-up investigations as suggested in current guidelines.12 This seems especially relevant because in many follow-up investigations, no new T2/fluid-attenuated inversion recovery (FLAIR) lesions are delineated. We analyzed the diagnostic value of the Gd administration in follow-up investigations, if no novel T2/FLAIR hyperintense lesions are found on precontrast scans. We assessed MRI investigations in a large cohort of patients to quantify disease activity on T2 and contrast-enhanced T1 imaging. We analyzed whether GBCA provided additional diagnostic benefit in the assessment of disease activity. We hypothesized that re-enhancement of a preexisting lesion (“lesion reactivation”) is rare and that Gd administration might be dispensable if no new T2/FLAIR lesions are found. We included 100 patients with confirmed MS in this retrospective clinical trial (48 men and 52 women; mean age 39.9 ± 11.9 years, range 18–64 years). We expected to observe at least 113 new contrast-enhancing (CE) T1 lesions within the cohort of 100 patients and a total number >500 follow-up MRIs. We calculated that this is sufficient to characterize the proportion of missed lesions by a 95% confidence interval not wider than 5%, given that the proportion of missed lesions was ∼1%. Patients performed MRI scans in our department between 2010 and 2017. The study population consisted of patients with relapsing-remitting MS (n = 90; 90%), primary progressive MS (n = 2; 2%), and secondary progressive MS (n = 8; 8%). The mean Expanded Disability Status Scale (EDSS) score was 2.75 ± 1.93, and the median disease duration was 4.0 ± 2.6 years. Patients were seen in the Department of Neurology (University Hospital Heidelberg) and were eligible for this trial, if the following inclusion criteria were met: confirmed diagnosis of MS, in-house standardized MRI available, and age ≥18 years. Exclusion criteria included contraindications for MRI (pacemaker and metal implant) or Gd contrast agents (impaired renal function, pregnancy, and history of allergic reaction toward MRI contrast agents). Informed consent was obtained from all study participants. The study adhered to the Declaration of Helsinki and was approved by the local ethics committee of the Medical Faculty, University of Heidelberg (study permit number: S-616/2017). MRI was performed on a Siemens Verio or TRIO 3-T MRI scanner (Siemens, Erlangen, Germany), and patients were scanned in yearly intervals. Study sequences were standardized for all patients (table 1) and included a FLAIR sequence, axial T2-weighted, and T1-weighted magnetization-prepared rapid acquisition gradient echo sequence after Gd contrast administration (0.1 mmol/kg; Dotarem, Guerbet, France). T2-weighted and FLAIR sequences were acquired before contrast administration. Image analysis was performed by 3 independent neuroradiologists (K.K.-J., M.B., and M.O.B.). First, the number of new T2/FLAIR lesions was assessed in comparison with the previous scan on all available, longitudinal MRI follow-up studies. Each reading was compared with the previous MRI scan to determine novel T2/FLAIR lesions. In a second reading, Gd contrast enhancement on T1 images was assessed in all scans. We then compared new T2 lesions with contrast-enhancing lesions after Gd administration to determine which T2 lesions also show enhancement in T1 post-contrast images and to evaluate possible T2/FLAIR-negative Gd-enhancing lesions. “Reactivation of a lesion” was defined as new contrast enhancement of a previously existing T2/FLAIR lesion without apparent morphologic change of the T2/FLAIR lesion. “Persistent enhancement” was defined as Gd enhancement of the same lesion over a prolonged period (>6 months) on follow-up MRI. “Missed lesion” was defined as a lesion that showed Gd enhancement but no correlate on T2/FLAIR images. In addition, lesions that showed no morphological change on T2/FLAIR images in comparison with the previous scan but showed Gd enhancement (“reactivated lesions/persistent enhancement”) were defined as “missed lesion.” The T2 signal intensity ratio of CE vs nonenhancing lesions was quantified as signal intensitylesion/signal intensityNAWM. We also measured the maximum diameter of those new CE T1 lesions with a T2/FLAIR correlate vs the CE T1 lesions without T2/FLAIR correlate. Total T2/FLAIR and T1 Gd+ lesion load was assessed on the first and last available MRI to determine disease activity. Raw data are available from the corresponding authors upon reasonable request. Data are shown as mean ± SD or median (where indicated). Statistical analyses were performed in Prism (GraphPad, La Jolla). Two-tailed Student t tests were used to compare 2 groups. p < 0.05 was considered statistically significant (*p < 0.05; **p < 0.01; ***p < 0.001). We included 100 patients with MS with a follow-up time of 4.0 ± 2.6 years per patient and a median of 5 MRI scans per patient (range 3–18) in this retrospective study (for patients' details, see table 2). In these patients, we identified a total of 343 new T2/FLAIR lesions that developed during the follow-up time. Thirty percent of the scans (164 of 559 MRI) showed a new T2/FLAIR lesion. Moreover, there were 152 Gd CE lesions that developed during follow-up (table 3). Of the Gd-enhancing lesions, 145/152 (95.4%) showed a correlate as a new T2/FLAIR lesion. Three enhancing lesions (1.9% of all CE lesions) were without correlate on T2/FLAIR images (figure 1). Morphologically, these lesions were smaller in size than lesions that showed a T2/FLAIR correlate (lesion diameter on T1 CE: 2.3 mm vs 6.3 mm, p < 0.05). CE = contrast enhancing; FLAIR = fluid-attenuated inversion recovery. Four lesions (2.6% of all CE lesions) showed enhancement of a preexisting T2/FLAIR lesion. One lesion (0.6% of all CE lesions) had persistent enhancement over at least 11 months, showing enhancement on several follow-up scans (figure 2A). Three additional lesions (1.9% of all CE lesions) exhibited reactivated Gd uptake of a preexisting lesion without apparent morphological changes of its T2/FLAIR characteristics (figure 2B). Of interest, the signal ratio expressed as T2/normal-appearing white matter (NAWM) markedly increased at the time of reactivation and normalized when the contrast enhancement faded again (figure 2C). T2-weighted and subtraction images (CE T1—T1 before gadolinium (Gd) administration) of a patient with persistent contrast enhancement of a periventricular lesion at the right frontal horn (box and magnified image) (A). First and follow-up MRI in A are 11 months apart. Example of a patient with a lesion in the left precentral gyrus (box and magnified image) that shows contrast enhancement of a preexisting lesion (“lesion reactivation”) on the 4th follow-up scan (B). This goes along with an increased T2 signal ratio (C). T2 signal ratio of enhancing and nonenhancing lesions (D); N = 78 lesions. Whiskers indicate 5th and 95th percentiles. The box is 25th and 75th percentiles. CE-sub = contrast-enhanced subtraction post-pre Gd-T1 MRI; FLAIR = fluid-attenuated inversion recovery; NAWM = normal-appearing white matter; SR = signal ratio. To further understand which lesions were more likely to show enhancement, we quantified the T2 signal ratio of Gd-enhancing vs nonenhancing lesions. We found that enhancing lesions showed higher T2 signal ratios than lesions without enhancement (T2 SRlesion/NAWM: 3.0 ± 0.1 vs 2.2 ± 0.1, p < 0.001, figure 2D), indicating that concomitant severity of edema can be a hint for the probability of enhancement. To further stratify the probability of missing lesions, we grouped patients for disease severity according to the total T2 lesion load, disease activity (new T2 and T1 lesions during follow-up), and EDSS. We analyzed whether the 7 patients with “possibly missed lesions” had a more severe disease course, disability, or clinical severity compared with patients without T2/FLAIR/CE lesion discrepancy. We found that this subgroup exhibited a higher frequency of contrast-enhancing lesions per follow-up MRI (0.53 new CE T1 lesions/follow-up vs 0.20 of the remaining cohort, p < 0.05). The EDSS, total lesion load, and disease activity on T2 were not different in this subgroup (p > 0.05). The overall probability of missing CE lesions in patients with stable T2 follow-up examinations was 1.7% (7 lesions in 395 MRI examinations with stable T2). Our study shows that in the vast majority of follow-up MRI investigations of patients with MS without new symptoms or new T2 lesions, Gd administration does not increase the diagnostic yield. This does, however, not apply to the time of initial diagnosis or when new MS symptoms are present. Here, Gd enhancement constitutes an important factor for swift therapy induction or escalating therapy. Also, Gd enhancement can help in pharmacovigilance such as monitoring progressive multifocal leukoencephalopathy.19,20 However, it is not clear what the relevance of enhancement in the absence of a new T2 lesion is. We observed that the additionally identified enhancing lesions where T1CE exhibits higher sensitivity than T2/FLAIR were rare (<2%). Overall, the probability to miss active lesions in patients with low disease activity and without new lesions seems negligible. However, in heavily affected patients with a high lesion load, it seems unlikely that missing small contrast-enhancing lesions truly makes a difference for treatment decisions. Blood-brain barrier disruption without T2 progress is rare (∼1.7%), and even in these rare cases, the therapeutic relevance of isolated CE lesions seems questionable. Also, it is not entirely clear how contrast enhancement without T2 correlate can be explained. Most likely, this might constitute a developing “early lesion” that shows already BBB-D but so far no edema.21 Reactivation is an interesting pathophysiologic concept that might indicate secondary fueling of a preexisting lesion. Also, it is conceivable that the different lesion types, evident on neuropathologic assessment (active, inactive, and smoldering MS plaques),22 might have different Gd-uptake properties over time. Our study proposes a possible solution by carefully screening precontrast sequences during the acquisition of the scan when the patient is still in the scanner to decide whether new T2 lesions are present. Only if new T2 lesions are identified, Gd administration should be considered. In our study, new T2 lesions were present in 30% of the follow-up scans. The main additional information of potential Gd enhancement could be that the enhancing lesion is roughly 1–10 weeks old.24 Disease activity per se is already indicated by the occurrence of a new T2 lesion. We acknowledge that it can be challenging to perform “online analysis” to decide whether there are new T2 lesions in clinical routine and additional technical developments to coregister follow-up imaging studies and tools to semiautomatically quantify lesion load would be desirable.25,26 Our approach would cut Gd administration by ∼70% and thus could increase patients' compliance in undergoing regular MRI examinations. Limitations of the current study mainly include the retrospective design. This led to varying numbers and time intervals of MRI scans and overall follow-up time. We tried to compensate for this confounder using a standardized MRI protocol for all patients. Furthermore, the number of “missed lesions” is low, which limits the power of statistical analysis and further in-depth analysis of this subgroup. However, this also underlines our main finding that missing enhancing lesions in otherwise stable T2 patients is unlikely (1.7%). Nevertheless, our findings should be validated in a prospective design with predefined imaging intervals and possibly a larger patient cohort to further define this subgroup. Also, it can be speculated that progressive disease with smoldering lesions might show more reactivated or persistently enhancing lesions. Our study shows that the probability of missing active contrast-enhancing lesions is very low if the T2 lesion load is stable. Thus, Gd contrast agents in follow-up examinations in patients with MS should only be administered in case of new T2 lesions or if new clinical symptoms occur. Our study should initiate further investigations to refine Gd administration to the clinical needs and diagnostic benefit, given the accumulating evidence that GBCA can accumulate in the brain. K. Karimian-Jazi performed MRI readings and wrote the manuscript. B. Wildemann screened patients, performed neurologic examinations, and provided clinical data. R. Diem screened and enrolled patients into the study, performed neurologic examinations, and provided clinical data. T. Hielscher performed biometrical planning and statistical analysis. D. Schwarz performed MRI readings. W. Wick performed neurologic examinations and provided clinical data. M. Bendszus designed the study, performed MRI readings, obtained funding, and wrote the manuscript. M.O. Breckwoldt designed the study, performed MRI readings, performed statistical analysis, and wrote the manuscript. The study was supported by the Novartis Foundation for Therapeutic Research (Nürnberg, Germany). K. Karimian-Jazi reports no disclosures. B. Wildemann served on the scientific advisory boards of Novartis, Sanofi Genzyme, and Roche; received speaker honoraria and/or travel funding from Biogen, Merck Serono, Novartis, Teva, and Sanofi Genzyme; and received research support from Bundesministerium für Forschung und Technologie, Dietmar Hopp Stiftung, Klaus Tschira Stiftung, Merck Serono, Novartis, and Sanofi Genzyme. R. Diem, D. Schwarz, and T. Hielscher report no disclosures. W. Wick received travel funding and/or speaker honoraria from Hoffmann La Roche, and MSD; served on the editorial board of Neuro-Oncology; served as an Associate Editor of Neuro-Oncology and CNS Oncology; served as a handling editor of the Journal of Neurochemistry; served on the speaker's bureau of Prime Oncology; and received research support from Apogenix, Eli Lilly, Charitable Hertie Foundation, German Ministry of Technology BMBF, German Research Foundation, and German Cancer Aid. M. Bendszus served on the scientific advisory board of ECASS, TENSION, Springer, Boehringer, BBRaun, and Vascular Dynamics; received speaker honoraria from Guerbet, Bayer, Novartis, Codman, Roche, and Teva; is coeditor of Clinical Neuroradiology; and received research support from Novartis, Guerbet, Siemens, Bayer Healthcare, Hopp Foundation, European Union, and DFG. M.O. Breckwoldt received research support from the Novartis Foundation for Therapeutic Research and Else-Kroner Fresenius Stiftung. Full disclosure form information provided by the authors is available with the full text of this article at Neurology.org/NN. The authors thank L. Diebold and Dr. S. Bonekamp (Neuroradiology Department, University Hospital Heidelberg) for organizational support of this study. M.O.B. was supported by the Else-Kröner Fresenius Stiftung. The funders had no influence in the design, analysis, or interpretation of the study. Accepted in final form June 5, 2018. Copyright © 2018 The Author(s). Published by Wolters Kluwer Health, Inc. on behalf of the American Academy of Neurology.
. Multiple sclerosis-the plaque and its pathogenesis. N Engl J Med 2006;354:942–955.
. Multiple sclerosis: an immune or neurodegenerative disorder? Annu Rev Neurosci 2008;31:247–269.
. Multiple sclerosis. N Engl J Med 2018;378:169–180.
. MRI criteria for the diagnosis of multiple sclerosis: MAGNIMS consensus guidelines. Lancet Neurol 2016;15:292–303.
. Diagnostic criteria for multiple sclerosis: 2010 revisions to the McDonald criteria. Ann Neurol 2011;69:292–302.
. Advanced MRI and staging of multiple sclerosis lesions. Nat Rev Neurol 2016;12:358–368.
. Ocrelizumab versus interferon beta-1a in relapsing multiple sclerosis. N Engl J Med 2017;376:221–234.
. MRI as an outcome in multiple sclerosis clinical trials. Neurology 2009;72:705–711.
. Gadolinium retention in the dentate nucleus and globus pallidus is dependent on the class of contrast agent. Radiology 2015;275:783–791.
. High signal intensity in the dentate nucleus and globus pallidus on unenhanced T1-weighted MR images: relationship with increasing cumulative dose of a gadolinium-based contrast material. Radiology 2014;270:834–841. ; International Society for Magnetic Resonance in Medicine. Gadolinium deposition in the brain: summary of evidence and recommendations. Lancet Neurol 2017;16:564–570.
. MAGNIMS consensus guidelines on the use of MRI in multiple sclerosis: establishing disease prognosis and monitoring patients. Nat Rev Neurol 2015;11:597–606.
. Histology and gadolinium distribution in the rodent brain after the administration of cumulative high doses of linear and macrocyclic gadolinium-based contrast agents. Invest Radiol 2017;52:324–333. FDA evaluating the risk of brain deposits with repeated use of gadolinium-based contrast agents for magnetic resonance imaging (MRI). 2017:1–4. Available at: https://www.fda.gov/Drugs/DrugSafety/ucm589213.htm. Accessed June 15, 2018. European Medicines Agency. EMA's final opinion confirms restrictions on use of linear gadolinium agents in body scans. 2017:1–4. Available at: ema.europa.eu/ema/index.jsp?curl=pages/news_and_events/news/2017/07/news_detail_002780.jsp&mid=WC0b01ac058004d5c1. Accessed June 15, 2018.
. Addressing concerns regarding the use of gadolinium in a standardized MRI protocol for the diagnosis and follow-up of multiple sclerosis. AJNR 2016;37:E82–E83.
. Comparison of gadolinium concentrations within multiple rat organs after intravenous administration of linear versus macrocyclic gadolinium chelates. Radiology 2017;285:536–545.
. Cost benefit analysis of radiological protection: a case study of remote after-loading in gynaecological radiotherapy. Br J Radiol 1983;56:737–744.
. Neuroimaging of natalizumab complications in multiple sclerosis: PML and other Associated entities. Mult Scler 2015;2015:809252.
. Reactivation of JC virus and development of PML in patients with multiple sclerosis. Neurology 2007;68:985–990.
. Sensitivity of contrast enhanced MRI in multiple sclerosis: effects of gadolinium dose, magnetization transfer contrast and delayed imaging. Brain 1997;120:1149–1161.
. Clinical and pathological insights into the dynamic nature of the white matter multiple sclerosis plaque. Ann Neurol 2015;78:710–721.
. Predicting breakdown of the blood-brain barrier in multiple sclerosis without contrast agents. 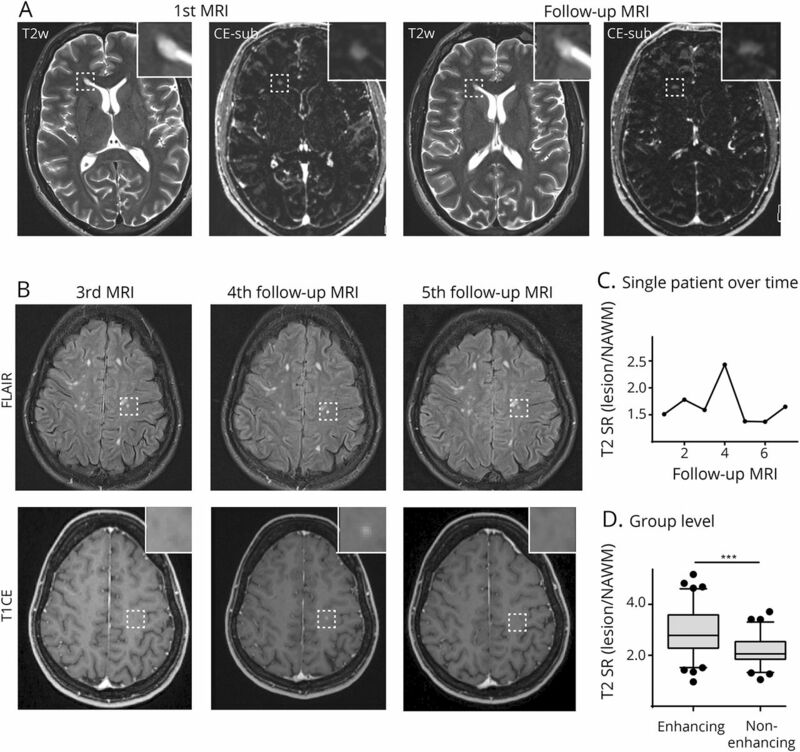 AJNR 2012;33:1586–1590.
. MRI contrast uptake in new lesions in relapsing-remitting MS followed at weekly intervals. Neurology 2003;60:640–646.
. An automated tool for detection of FLAIR-hyperintense white-matter lesions in Multiple Sclerosis. Neuroimage 2010;59:1–10.
. FLAIRfusion processing with contrast inversion: improving detection and reading time of new cerebral MS lesions. Clin Neuroradiol Epub 2017 Mar 6.